FirefighterPrep - Firefighter Test Training Course To Get You Hired! FirefighterPrep provides a complete training program to help you pass all stages of the Fire Department recruitment process. Our full access site provides you with 11 practice exams with instant feedback and solutions. You can take the tests as often as you wish. 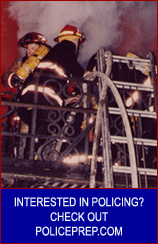 You will find teaching material on all the skills and abilities tested by the Fire Departments you are applying to. Click below if you are an attendee and have a code. » Do the tests as often as you like!